Send heartfelt messages anywhere in the world with this kinetic, modern take on the classic love note. When designer Jean Gregoire went to the US to study at MIT (just wait, this gets really romantic), he wanted to find a new way to send his love to his fiancée, Melodie, back in France. Super sweet, right? His answer was this romantic messenger. Send heartfelt messages to loved ones—anytime, anywhere in the world—with this modern take on the classic love note. When you send a new message through the easy-to-use app, the chunky heart on the beechwood box spins to alert the recipient. Then, the object of your affection opens the box to read the sentiment on the mirrored screen inside. They can return the virtual embrace by spinning the heart to send a shower of digital hearts to the sender's screen. Proof positive that romance will never be passé (that's French for "meh"), it's a tangible way to stay connected with special friends, family, and long-distance lovers. Created by Marie Poulle and Jean Gregoire. Made in France. See how to set up your Lovebox here. Read the sweet origin story of the Lovebox on our blog. Jean Gregoire always wanted to start his own business. Turns out it was love that launched it. He met his fiancée, Melodie, at an engineering school in Paris and, after a trip around the world for several months together, they were separated for more than a year when Jean went to study at MIT. Before flying to Boston, he created the first Lovebox for Melodie. He wanted to leave her with an object that let her receive his transatlantic messages of love as if they were gifts. Do not expose to water. Do not expose to heat. The device is restricted to indoor use only. 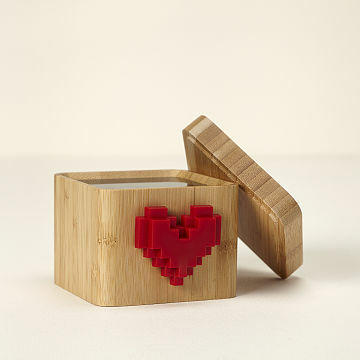 Package contains: The Lovebox, pixel heart, Micro USB cable, power adapter (5V 1A) and user guide. The Lovebox Connected Messenger is compatible with a dual band Wifi network or standard 2.4Ghz home WiFi. It is not compatible with 5Ghz or with most universities or corporate WiFi systems (WPA-Enterprise). See if there is a "guest" WiFi network or contact your institution's IT team to find out how to connect to their network. All of my siblings can send my dad Lovebox texts. It's great. I love to send my wife thoughtful messages each day. So much better than a text. Such a sweet way to send a love note! Such a sweet way to let my husband know I'm thinking about him when he is working out of town! We send little messages of love to our mom who lives in a different state. This box is so well made, the best $ I spent on a gift and this gift keeps on giving. Kudos to the creator of this thing, LOVE LOVE LOVE! This Product was everything that I had wished for! Easy plug and play! So differently adorable! Makes for a happy wife! This was a gift to my boyfriend who I do long distance with. We absolutely love it. The instructions for setup and downloading of the app are super simple. I'm able to send him messages via the app. It can be a message with text, drawings, or little icons. He'll know he has a message because the heart on the box will spin. He can either send me love or remind me to send him a message if I forgot to by spinning the heart on the box - that'll flood my phone screen with hearts. It's almost like a 2 in 1 gift since we both benefit from buying 1! I also love that the app kind of encourages you to send gifts to each other by having a little heart-o-meter. As you send more messages, the meter fills up and you can unlock more icons and capabilities within the app. Seriously the cutest thing ever. It definitely brightens up our day. My daughter has the love box in her room at her fathers house. It's perfect to send little thoughtful messages before bed or before school. I gave it to my grandmother so we could send her sweet messages to make her smile even though she isn't tech savvy. Bought as a gift for my mother, she loves it and it works great! It's perfect to send a hello or love. Can type or draw any message, a few emojis & stickers to choose from too. She always sends back hearts by spinning. I always have trouble setting up things like this so it took me a few tries but got it. After set up had to unplug it to move it but it reconnected itself. Highly recommend!